Congrats for organising the event very successfully. I wish to record my sincere thanks and appreciation for the opportunity to be a part of a lively panel at the Conclave. True to your inimitable style the function was a grand success. 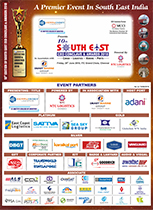 Congratulations on another most successful event in Chennai. The session with the secretary shipping was a great success and it was a great accolade to the prestige of these events that he devoted the time to attend. Thanks again for a great event and I look forward to seeing you again before too long. Mr. Nityam Khosla & Mr. Vivek Kele, Director’s, Teamglobal Logistics Pvt. Ltd.
As always the event was well organised. Mr. Shankar Menon P., Director, Chakiat Agencies Pvt. Ltd.
We are always happy to participate in your events. Wishing you all success in the future. Mr. Eric Lavenu, CEO, Dakshin Bharat Gateway Terminal Pvt. Ltd. 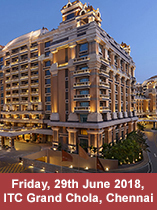 This 10th South East CEO Conclave & Awards last Friday 29th June 2018 at ITC Grand Chola, Chennai, has been so well organized. No criticism from my side, everything went well, good quality of speakers and overall event was wonderful. Definitely you can count on our full support for future events. Mr. Elango Thyagarajan, Sr. Manager Sales Execution, Hapag-Lloyd India Pvt. Ltd. Many thanks for your excellent arrangement and usual good hospitality provided to us. Mr. R. Gopi, CEO, Shiftco Shipping & Logistics India Pvt. Ltd.
We take this great opportunity to admit our thanks towards your enthusiasm to attend grate success for the wonderful event organised. It’s very impressed and informative one along with trade members. Event was organized very professional way. We happy added with part of this Great Event. We wish you all the success to go many more.